Golden Spike National Historic Site is a U.S. National Historic Site located at Promontory Summit, north of the Great Salt Lake in Utah. It commemorates the completion of the first Transcontinental Railroad where the Central Pacific Railroad and the Union Pacific Railroad met on May 10, 1869. The final joining of the rails spanning the continent was signified by the driving of the ceremonial Golden Spike.This location is off the beaten path to be sure, but it was really neat to see the train replicas. Lots of neat things to photograph, a nice gift shop, no restaurant, but bathrooms. VISITOR CENTER hours are 9:00 a.m. to 5:00 p.m. daily. There is an entrance fee for vehicles $5 (winter) and $7 (summer). Golden Spike National Historic Site will be closed New Year s Day, Thanksgiving Day, and Christmas Day. Outside attractions are open during daylight hours.. This is a hand-crank machine located at the back of the visitors center near the doors leading out to the trains. 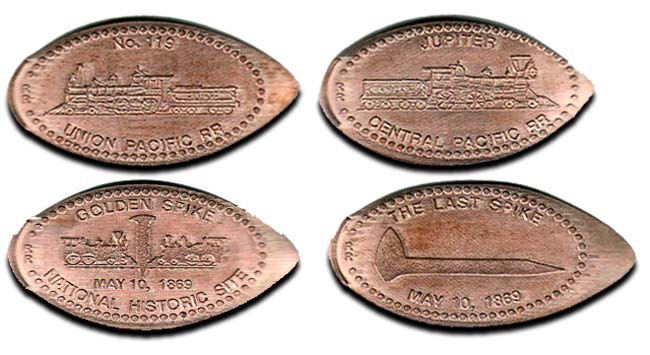 There are four designs: Each reverse is printed with "Golden Spike National Historic Site May 10, 1869". 4) The Last Spike, May 10, 1869.